This PySide tutorial shows you how to define constant values (with hierarchical structures) and expose them to QML. This allows you to define often-used constants (e.g. the size of a finger-friendly widget) and change them globally in your UI simply by changing the code in your Python script. 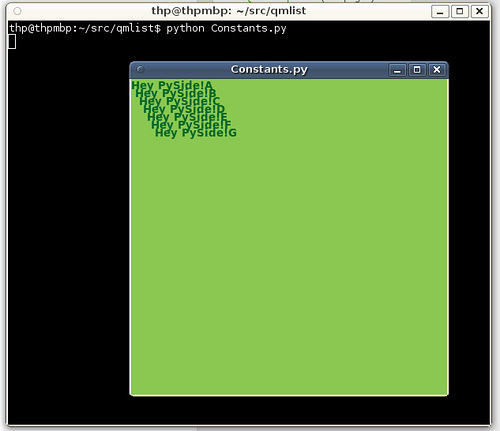 Of course, as it is a simple Python Dictionary, you can also generate the data programatically. Be aware that this example does not allow you to change the values once you have set the context property (for this, you would need a QObject with a NOTIFYable properties). This is easy - simply create a new QApplication, passing the command line parameters to its constructor. Then create a QDeclarativeView and configure it so that whenever the window is resized, the root object automatically changes size as well. Assuming the QML file lies in the current directory, simply set its filename with setSource on the view. Then, let the window appear with show() and finally start the application using exec_() on our QApplication instance. Now that you have "injected" your constants as "C" context property, you can now access its items as if they were attributes. This also works for nested dictionaries (e.g. C.Items.Count) and also for lists (e.g. C.Items.Suffixes[index]). Be aware that with this approach, you cannot change constants later (e.g. when you want to change the background color at runtime or something. This page was last modified on 26 February 2018, at 11:56.